Samuel FOSTER (1743 – 1825) was Alex’s 6th Grandfather; one of 128 in this generation of the Shaw line. 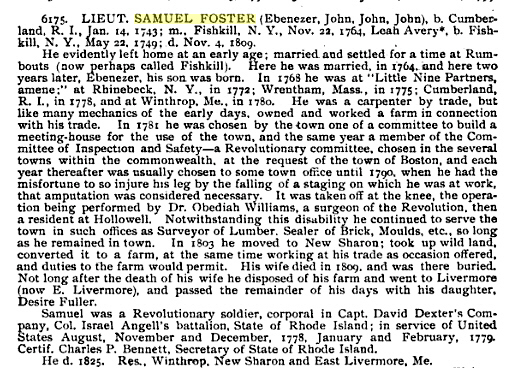 Samuel Foster was born 14 Jun 1743 in Attleboro, Bristol, Mass. His parents were Ebenezer FOSTER and Desire CUSHMAN. He married Leah EVERY 22 Nov 1764 in Fishkill, Dutchess, NY. Samuel died 7 Apr 1825 in Livermore, Androscoggin, Maine. Leah Every (Avery) was born 22 May 1749 in Rumbout, Dutchess, NY. Her parents were John EVERY and Rachel WILLIAMS. Leah died 4 Nov 1809 in New Sharon, Franklin, Maine. 16 Jun 1799 in Attleboro, Bristol Co, MA. 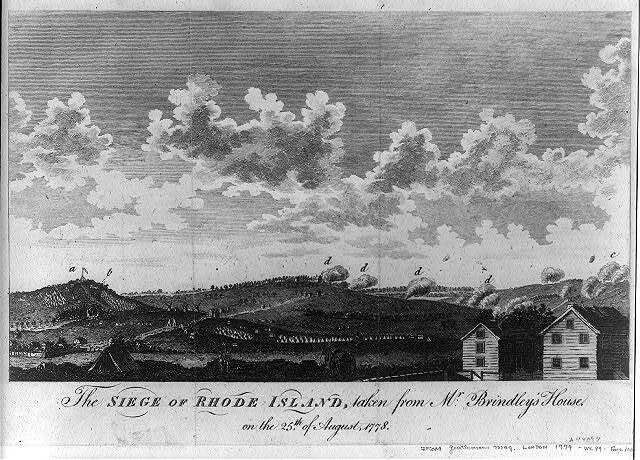 Samuel was a Corporal in the Battle of Rhode Island – This print is from 1779, titled “The siege of Rhode Island, taken from Mr. Brindley’s house on the 25th of August, 1778” Illus. in: The Gentleman’s magazine. 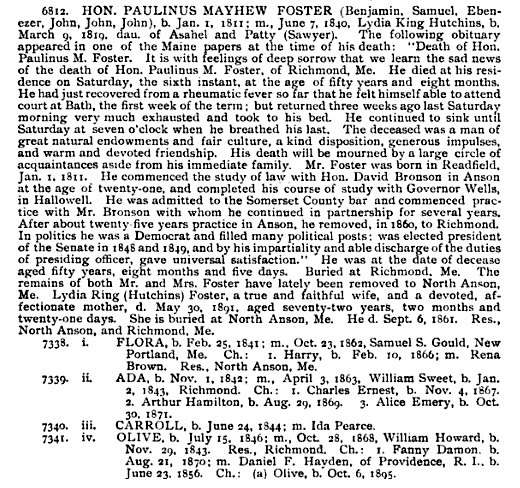 Samuel Foster evidently left home at an early age; married and settled for a time at Rumbouts (present day Fishkill, Dutchess County, New York about 60 miles north of NYC). Here he was married, in 1764, and here two years later, Ebenezer, his son was born. The Rombout Patent was granted in 1685 to François Rombout and G. Verplanck and encompassed the area that today would be the towns of Fishkill, East Fishkill, LaGrange, Wappingers, and portions of the town of Poughkeepsie. Catharine Rombout, daughter of François, inherited these vast holdings. In 1768 Samuel was at Little Nine Partners Patent; at Rhinebeck. N. Y., in 1772; Wrentham, Mass., in 1775; Cumberland, Rhode Island [near his origins in Attleboro, Mass], in 1778, and at Winthrop, Maine in 178o. Samuel was a Revolutionary soldier, corporal in Capt. David Dexter’s Company, Col. Israel Angell’s battalion, 2nd Rhode Island Regment; in service of United States August, November and December, 1778, January and February, 1779. Certif. 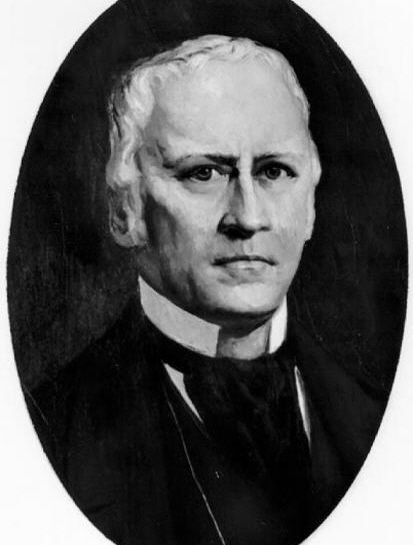 Charles P. Bennett, Secretary of State of Rhode Island. The Regiment entered Valley Forge with 335 men assigned and 233 fit for duty and left Valley Forge with the 1st Rhode Island Regiment. 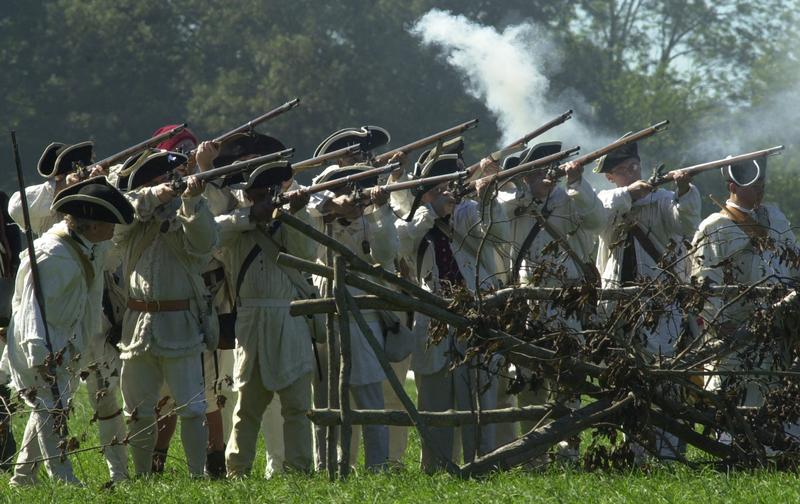 The 2nd Rhode Island Regiment served to February 1781, having distinguished itself at the Battles of Monmouth, Rhode Island, and Springfield with several other skirmishes and minor engagements. Samuel participated in the Battle of Rhode Island, (also known as the Battle of Quaker Hill) which took place on August 29, 1778, when units of the Continental Army under the command of John Sullivan attempted to recapture the island of Rhode Island (now known as Aquidneck Island to distinguish it from the state of Rhode Island in which it is located), from British forces. The battle ended inconclusively but the Continental Army had to give up its goal of capturing the island and securing Narragansett Bay for American and French ship traffic. He was a carpenter by trade, but like many mechanics of the early days, owned and worked a farm in connection with his trade. In 1781 he was chosen by the town one of a committee to build a meeting-house for the use of the town, and the same year a member of the Committee of Inspection and Safety—a Revolutionary committee, chosen in the several towns within the commonwealth, at the request of the town of Boston, and each year thereafter was usually chosen to some town office until 179o, when he had the misfortune to so injure his leg by the falling of a staging on which he was at work, that amputation was considered necessary. It was taken off at the knee, the operation being performed by Dr. Obediah Williams, a surgeon of the Revolution, then a resident at Hollowell. Notwithstanding this disability he continued to serve the town in such offices as Surveyor of Lumber. Sealer of Brick, Moulds, etc., so long as he remained in town. In 1803 he moved to New Sharon, Franklin Maine; took up wild land, converted it to a farm, at the same time working at his trade as occasion offered, and duties to the farm would permit. His wife died in 1809, and was buried there. 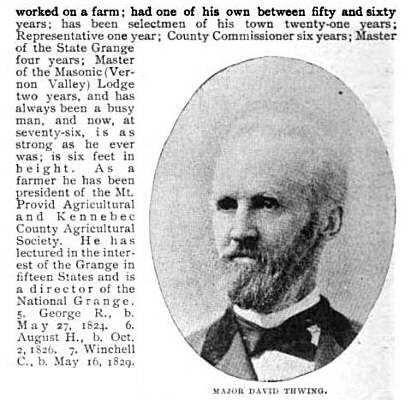 Not long after the death of his wife he disposed of his farm and went to Livermore (now E. Livermore), and passed the remainder of his days with his daughter, Desire Fuller. 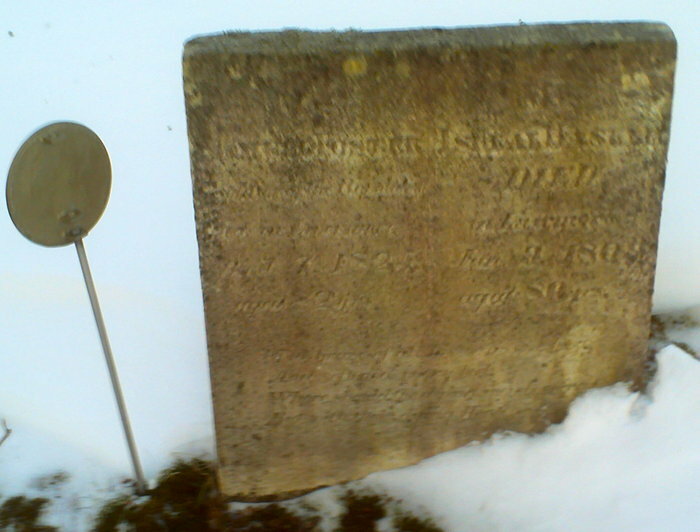 Samuel died in 1825. Resident, Winthrop, New Sharon and East Livermore, Maine. Ebenezer’s first wife Asneath Orne was born 28 Dec 1769 – Attleboro, Bristol, Mass. Her parents were Lt. James Orne and Esther Everett. Asneath may have died 24 Dec 1795 – Wrentham, Suffolk, Mass. Ebenezer’s second wife Ruth Walcott was born 12 Nov 1777 Attleboro, Mass. Her parents were Moses Walcott and Ruth Whipple. Ebenezer was an inn-keeper and later operated one of the first stage lines between Providence and Boston. He resided in Providence. ii. Asenath Orne Foster b. 15 Feb 1800 in Providence, Rhode Island; d. 29 Sep 1884 Packer Cemetery Mount Holly, Rutland County, Vermont; Unmarried. Anna’s father was born in Scotland and her mother in the West Indies. Ann arrived in New York City 17 May 1839 age 9 on the Barque Condor. I don’t see her parents listed on the manifest. She is listed as a Spanish citizen. In the 1850 census, she was living in New York City, with the Peter Perrine family. In the 1880 census, Samuel was the manager of a bonded warehouse in Newport, Newport, Rhode Island. Richard’s wife Clarissa Harlowe Barton was born 11 Sep 1770 in Oxford, Worcester, Mass. Her parents were Dr. Stephen Barton and Dorothy Moore. Her niece was Clara Barton , the founder of the Red Cross. Clarissa died 13 Nov 1843 in Maine. i. Parthene (Pathenia) Barton Foster b. 18 May 1792;d. Aft. 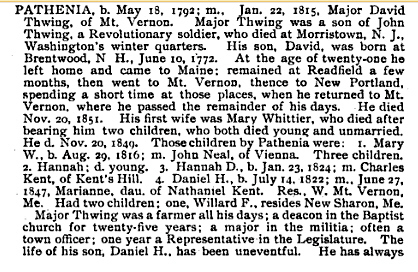 1860 census Mount Vernon, Kennebec, Maine m. 22 Jan 1815 to Maj. David Thwing (b. 10 Jun 1772 in Brentwood, New Hampshire – d. 20 Nov 1851 in Auburn Androscoggin Maine) He first married Mary Whittier. ii. Ebenezer Foster b. 14 Aug 1794 in St Stephen, New Brunswick, Canada; d. 23 May 1853 Maine; m. 30 Dec 1819 in Industry, Franklin, Maine to Mary B Crabtree (b. 5 May 1800 in St Stephen, New Brunswick, Canada – d. 5 Jul 1877 in Danforth, Washington, Maine) In the 1850 census, Ebenezer was farming in Danforth, Washington, Maine. ix. Walcott Foster b. 12 Mar 1812 in New Sharon, Franklin, Maine; m. Mabrianna (Malvinar) Atwood (b.1816 New Hampshire) In the 1850 census, Walcott was farming in New Sharon, Franklin, Maine. His son Eben was killed in the Civil War. Eben enlisted in Company C, Maine 1st Heavy Artillery Regiment on 05 Feb 1863. Killed Company C, 1st Heavy Artillery Regiment Maine on 19 May 1864 at the Battle of Spotsylvania Court House, Virginia. In the end, the battle was tactically inconclusive, but with almost 32,000 casualties on both sides, it was the costliest battle of the Overland campaign. Eben was killed at the Harris Farm Engagement which claimed 1,598 casualties on both sides. 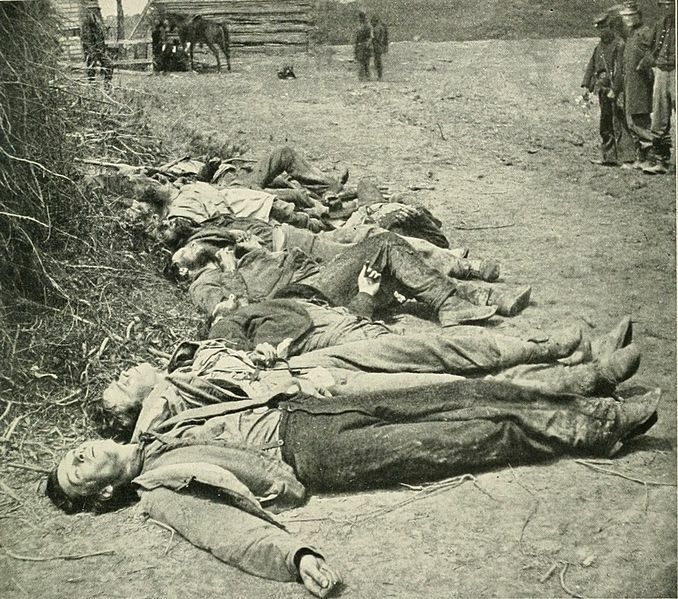 The Harris Farm Engagement was the end of the long Battle of the Spotsylvania Courthouse. x. Viletta Foster b. 9 May 1815 in New Sharon, Franklin, Maine; m. James Lane (b. 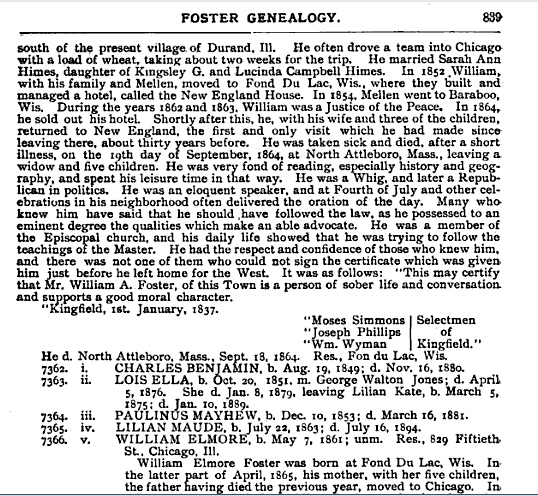 1811) In the 1880 census, James and Viletta were living in Auburn, Androscoggin, Maine where James was a stone mason. Mary’s first husband Edward Washburn was born 1766 in Middleboro, Mass. His parents were Stephen Washburn and Hannah Norris. Edward drowned 14 Feb 1810 in Winthrop, Kennebec, Maine. Mary’s second husband Jacob Haskell was born in 26 Jul 1769 in New Gloucester, Cumberland, Maine. His parents were Israel Haskell and Abigail Davis. Jacob died 19 Sep 1842 – Livermore, Androscoggin, Maine. New Gloucester was abandoned from 1744-1751 due to the heightened Indian attacks during King George’s War. Settlers returned and in 1753 commenced work on a two story, fifty-foot square blockhouse with a palisade stockade 110 feet on a side. This was home to twelve families for six years. The men worked at clearing the surrounding 60 acres of common land under the protection of two swivel guns manned by a garrison of six soldiers. 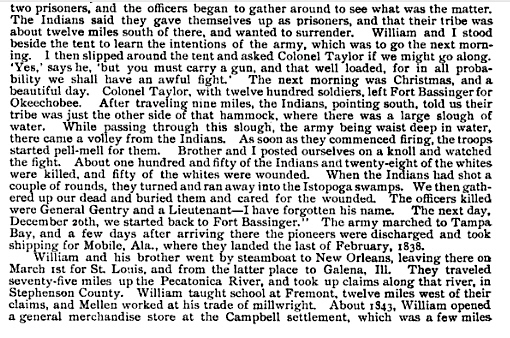 One attack was made upon the fort, resulting in one scalping and two men captured. As the Indians gradually withdrew to Canada, the settlers moved out into their own newly built homes. The blockhouse continued to serve for worship and town affairs until the first meetinghouse was built in 1773. In 1788, the blockhouse was sold at auction for seven bushels of corn and moved to a farm in the intervale, where it was rebuilt as a hog house. i. Edward Washburn? b. 1 Mar 1786; d. 11 Jul 1872 Corinna Center Cemetery, Corinna, Penobscot County, Maine; m. 1814 to Betsy Farnham (b. 21 Jul 1785 in Norridgewock, Somerset, Maine – d. 1 Jun 1887 Corinna Center Cemetery, Corinna, Maine) NOTE: Edward is not listed as a child of Mary and Edward in Frederick Clifton Pierce’s 1899 Foster Genealogy In the 1850 census, Edward and Betsey were farming in Guilford, Piscataquis, Maine. iv. Cynthia Washburn b. 23 Dec 1794; d. 13 Jan 1838; m. 23 Feb 1822 to Oren Haskell (b. 1790) In the 1840 census, Oren was living in Livermore, Oxford, Maine with a family of 12. An Oren S Haskell of Levant, Penobscot, Maine, perhaps his son was mustered into Company A First Maine Volunteer Cavalry Regiment on Oct 11, 1861. He was promoted from private to Quartermaster Sargent on Jan 25. The Regiment was assigned to the Army of the Potomac. The total number of horses lost in action and worn out in service during 1862 amounting to nearly 700.
ix. Ruth Whittier Haskell b. 10 Feb 1812; d. 11 Jun 1870; m. William Trafton (b. 30 Mar 1793, Shapleigh, York, Maine – d. 11 Nov 1884) In the 1870 census, Ruth and William were living in Augusta, Kennebec, Maine where William was a life insurance agent. x. Sara Holmes Haskell b. 7 May 1814; d. 6 Dec 1887; m. 20 Aug 1835 to Eleazor Hartley W. Smith (b. 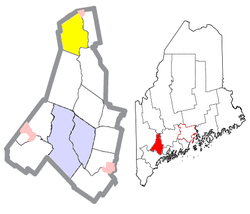 1810) In the 1880 census, Sarah and Eleazor were living in Augusta, Kennebec, Maine where Elezor was a retired bookbinder. Desire’s husband Abraham (Abram) Fuller was born 16 or 18 Dec 1771 in Barnstable, Mass. 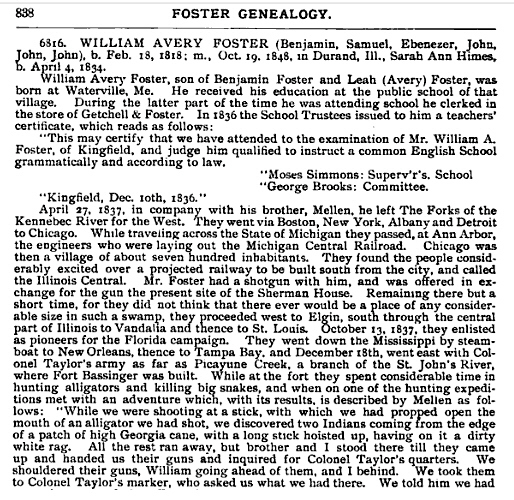 His parents were John Fuller and Anna Tobey. Abraham died 8 Dec 1856 in LaGrange, Penobscot, Maine. i. Oren Fuller b. 4 Feb 1803 in East Livermore, Androscoggin, Maine; d. 19 Nov 1869 La Grange, Penobscot, Maine; m. 26 Jun 1827 to Mary Hobbs (b. 1807 Maine) In the 1860 census, Orrin and Mary were farming in LaGrange, Penobscot, Maine and his mother Desire was living with the family. ii. Samuel F Fuller b. 31 Mar 1804 in East Livermore, Androscoggin, Maine; d. 3 Apr 1894 Bangor, Penobscot, Maine; m. 4 Mar 1833 in Livermore, Androscoggin, Maine to Betsey Morrison (b. 25 Apr 1813 in Livermore, Androscoggin, Maine – d. 7 Dec 1882 in Bangor, Penobscot, Maine or 3 Apr 1894 Minneapolis, Minnesota with her daughter Columbia Danforth. In the 1850 census, Samuel F and Betsey M were farming in Bangor, Penobscot, Maine with six children at home. iii. John Hiram Fuller b. 7 Aug 1806 in Livermore, Androscoggin, Maine; d. 1887 San Francisco? ; m. Hannah C. Hinds (b. 18 Apr1809 in Livermore, Androscoggin, Maine – d. Aft 1880 Census, San Francisco) In the 1860 census John H and Hannah C. were keeping a hotel in LaGrange, Penobscot, Maine. In the 1870 census, John, Hannah, Hinds and Florette were living with their son-in-law and daughter James and Eliza McKinley in San Francisco Ward 10, San Francisco, California. James was a dealer in wood and coal. In the 1860 census, James McKinley (b. 1834) was mining with his brothers in White Oak, El Dorado, California so it looks like Eliza might have met him in California. In the 1871 voter registration, his sons Hinds (b. 1834) and Frederick Oldham (b. 1836) were living together in Oakland, California. Hinds was a teamster and Frederick was a policeman. iv. Michael Fuller b. 6 May 1809 Maine; m. 27 Feb 1837 to Sarah Kelliher (b. 1813 Maine) In the 1880 census, Michael and Sarah were farming in La Grange, Penobscot, Maine. Mercy’s husband Timothy Sweet was born 9 Mar 1777 in Attleboro, Mass. His parents were Zebediah Sweet and Rebecca Perry. Timothy died 29 Feb 1852 in Strong, Franklin, Maine. i. Benjamin Sweet b. 16 Sep 1800 Avon, Kennebec, Maine; d. 7 May 1818 – killed by a falling tree in Avon, Maine. He was 17 years old. iii. Roxanna Sweet b. 21 Feb 1803 Avon Township, Kennebec, Maine; d. 3 Feb 1890 – Kingston, Delaware, Ohio; m1. 4 Nov 1825 – Porter, Delaware, Ohio to Isaiah Kempton (b. 1 May 1802 in Farmington, Franklin, Maine – d. 11 Mar 1850 in Porter Township, Delaware,Ohio); m2. 7 Sep 1862 Delaware, Ohio to John Roberts. In the 1850 census, Roxanna was a widow in Porter, Delaware, Ohio with ten children ages 6 to 24 at home. iv. Elias Sweet b. 28 Jul 1805 Avon, Franklin, Maine; d. 11 Jan 1891 Markesan, Green Lake, Wisconsin; m. Mary A Willard (b. 6 Dec 1812 Cape Elizabeth, South Portland, Cumberland, Maine – d. 26 Jan 1901 Green Lake, Wisconsin) In the 1860 census, Elias and Mary were farming in Mackford, Green Lake, Wisconsin. May 4, 1856 – Riot. June 3, 1856 – Riot. October 2, 1856 – Conflict between two native parties. United States forces landed. December 18, 1858 – Attempted secession of Panama. October 4, 1860 – Landing of United States forces in consequence. May 23, 1861 – Intervention of the United States forces required, by intendente. October 2, 1861 – Insurrection and civil war. April 4, 1862 – Measures to prevent rebels crossing Isthmus. vi. Betsy Sweet b. 9 Jul 1810 in Phillips, Franklin, Maine; d. 25 Feb 1864 Madrid, Maine; m. 19 Dec 1834 to Gilbert Voter (b. 9 Oct 1813 in Strong, Franklin, Maine – d. 10 Dec 1880) In the 1860 census, Betsey and Gilbert were farming in Madrid, Franklin, Maine. viii. Lavinia Hillman Sweet b. 28 Sep 1813; d. 26 Nov 1876 Weld, Maine; m. 23 Jun 1840 in Weld, Maine to George W Lufkin (b. 20 Mar 1809 in Freeport, Maine – d. 23 Dec 1884 in Maine) In the 1860 census, Lavinia and George were farming in Weld, Franklin, Maine. x. Asenath Foster Sweet b. 26 Jul 1817; d. 9 Jun 1893 – Avon, Franklin, Maine; m. 23 Dec 1851 to Jessie Sprague (b. 2 Mar 1818 in Avon, Franklin, Maine – d. 15 Jul 1868 in Avon, Franklin, Maine) In the 1860 census, Asenath and Jesse were farming in Avon, Franklin, Maine. William’s wife Roxanna Everett was born 2 May 1784 in Attleboro, Mass. Her parents were Lt. Samuel Evertt and Susanna Wallcott. v. Horace Foster b. 24 May 1812 (twin) in Attleboro, Mass. 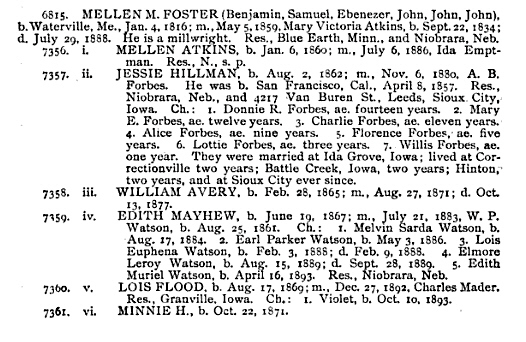 ; m. his first cousin Clarissa Hillman Foster (b. 1822 Maine); In the 1870 census, Horace was a jewelry worker in Attleboro, Bristol, Massachusetts. Benjamin’s wife Lavina Hillman was born in 7 Sep 1789 – Chilmark, Dukes, [Martha’s Vineyard] Mass. Her parents were Thomas Hillman and Ruth Mayhew. Lavina died in May 1867. 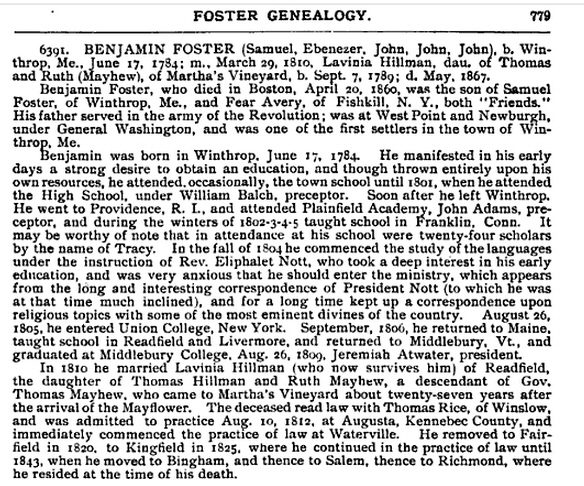 Benjamin Foster was a popular and successful teacher of schools in Livermore, Maine from 1806 to 1810 or 1811. He made this catalog of scholars of all the students in town. A Benjamin Foster was also an early Methodist minister in town. There are two US Census Mortality Schedule records for a Benjamin Foster born in 1785 in Maine: Apr 1860 – Boston Ward 5, Suffolk, Mass. and May 1860 – Richmond, Sagadahoc, Maine. Maybe Benjamin died away from home. In the 1860 census, Paulinus and Lydia were living in Richmond, Sagadahoc, Maine with ten children at home. Paulinus was a lawyer. Paulinus studied law in both Anson and Hallowell, having as his instructor in the latter place future Governor, Samuel Wells. After being admitted to the Somerset County Bar he practiced law for twenty-five years in Anson, moving to Richmond, Maine in 1860. According to an obituary published the year he died, he was an active Democrat all his life and filled several political posts. He was elected to the State Senate in 1848 and 1849, serving as President of that body in 1850.
ii. 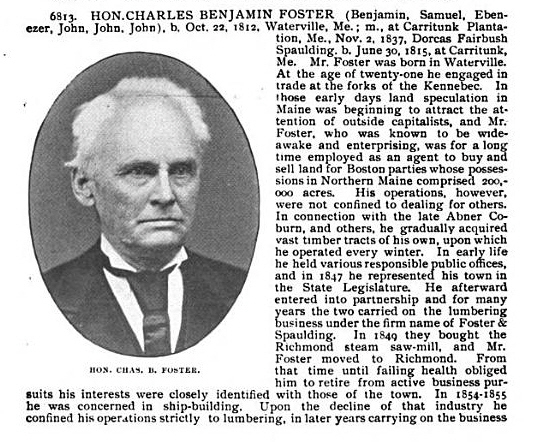 Charles Benjamin Foster b. 22 Oct 1812 in Readfield, Kennebec, Maine; d. 15 Nov 1889 – Richmond, Sagadahoc, Maine; m. 2 Nov 1837 to Dorcas Furbush Spaulding In the 1880 census, Charles and Dorcas were farming in Richmond, Sagadahoc, Maine. iii. Lavinia Hillman Foster b. 17 Feb 1814 in Readfield, Kennebec, Maine; m. Gustavus Smith of The Forks, Maine In the 1870 census, Gustavus and Lavinia were living in Richmond, Sagadahoc, Maine. Gustavus was a surveyor of lumber. iv. Mellen Michael Foster b. 4 Feb 1816 in Readfield, Kennebec, Maine; d. Aft. 1899; m2. 5 May 1859 to Mary Victoria Atkins (b. 2 Sep 1834 in England – d. 29 Jul 1888 in Correctionville, Iowa) The town name comes from the original survey of the town. The site lies on a surveyor’s correction line, which adjusts for the convergence of the meridian lines. This keeps the section boundaries approximately 1-mile (1.6 km) apart, making all sections approximately the same size (approximately 1 square mile). This correction line is aligned with 5th street through the downtown; there are no north/south streets extending straight past 5th street. vii. Charlotte E Foster b. 12 Sep 1822 in Readfield, Kennebec, Maine; d. Aft. 1880 censujs; m. St. Albans, Maine to Lorenzo Moore (b. 1815 Maine) e; In the 1870 census, Charlotte was a widow in North Providence District 1, Providence, Rhode Island. viii. Fidelia Stevens Foster b. 26 Aug 1825 in Readfield, Kennebec, Maine; d. 4 Jun 1872 Richmond, Maine. In the 1860 census, Fidelia was living with her sister Lavinia and brother-in-law Gustavus. x. Lois Ann Foster b. 2 Dec 1833 in Readfield, Kennebec, Maine; d. 13 Feb 1912 – Richmond, Maine; unmarried in 1899 living in Richmond, Maine. This entry was posted in -8th Generation, Line - Shaw, Pioneer, Veteran and tagged Battle of Momouth, Battle of Rhode Island, Corporal in the 2nd Rhode Island Regiment, Valley Forge. Bookmark the permalink. 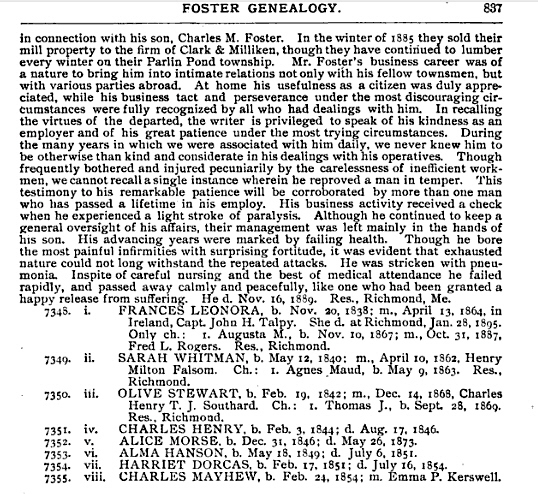 Added Samuel Foster’s 67 grandchildren, the cousins of our ancestor Josiah Harvey Foster (1806 – > 1860). Highlights include brothers Charles Benjamin Foster and Mellen Michael Foster’s adventures in 1838 Florida Indian Wars, the 1850 President of the Maine Senate Paulinus Mayhew Foster and Alanson Sweet who was killed Apr 19, 1858 in a Panama Riot on his way to California.